Those looking for a low-cost tiny computer for developer purposes or specific projects already have multiple products to choose from such as the FXI Cotton Candy and the Raspberry Pi. But if neither of those options tickles your fancy, perhaps the $49 Cubieboard can fulfill your needs. Hardware-wise, the Cubieboard is no slouch with a 1GHz ARM cortex-A8 paired with 512KB L2 cache, 1GB of DDR3 memory clocked at 480MHz, a Mali 400 OpenGL ES GPU and 4GB of NAND flash. Connectivity includes Ethernet, 1080p HDMI, a MultiMedia Card slot, a SATA port, two USB ports, an IR sensor and 96 expansion pins for whatever you wish to solder in place. There’s no built-in Wi-Fi or Bluetooth – those features must be added via USB dongles should you need them. Otherwise it’s a pretty solid offering that is capable of running Android, Ubuntu and other Linux distributions. Cubieboard’s website gives a few usage scenarios for the device if you come up short on ideas. One course of action would be to install Android 4.0 Ice Cream Sandwich and use the HDMI port to output the display to your television set. 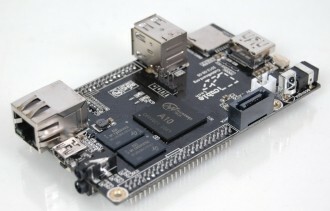 Using a USB mouse and keyboard, the Cubieboard could be used as a small computer when paired with an HDMI-enabled monitor and Linux. Finally, the manufacturer suggests using the device as a network attached storage system by utilizing the SATA port and 100M Ethernet connection. The Cubieboard should begin shipping to developers this week although it’s unclear when it will be available to the general public.